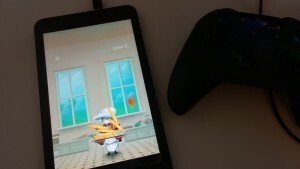 Pancake Panic is now working on a real device. Which is handy for testing. After a few days off working on some client-based work, and running a game development workshop in Greenwich, I had a chance to crack on with Pancake Panic on Monday. The animations for the chef are now implemented. Alex, our artist, used Spine to create the 2D graphics and to animate the characters. Everything is done here now, aside from a couple of reset positions, and to implement some of the “reaction” expressions (fear, joy, nerves). But the walking animations, and resets to a neutral state, are now working. The code that generates the pancakes and the power-ups now creates these items in a random position, and applies some force to these objects so the speed in which they fall also varies. These power-ups need to be collected on the tray in order to be activated. As they are small, and round, this can cause major disruption to any staked pancakes, which is really fun. We are now recording high scores. I still need to work on the end screen to display them. I’ve been working to improve the banking process. The button I was using before was a bit of a rubbish placeholder and didn’t work well when you started to scale the game to different screen sizes. This is now fixed. You can only score points by catching a strawberry and banking your stack. I had a chance to test the game with 40 year five pupils from Haimo Primary School yesterday (we ran a coding workshop there) and that mechanic was preferred by almost everyone. So that’s a fair bit of progress. We also have the game working on an actual device now, so we can test gameplay as if it were a store-based app. The goal now is to spend two more days on the game. In this time, there’s a short list of things to do, but each is a fairly complex task. Implement options for the game with regards to music volume, etc. Work on the end screen and options screen, and improve the start-up experience. The goal here, incidentally, isn’t to make money from the game. But by testing some different revenue streams, we can at least hope to learn what works and doesn’t work, and we can carry what we’ve learnt into Bad Day for a Balloon Ride. It’s also a chance for us to learn how this will work cross-platform. With regards to ads, we’re looking at maybe using AdDuplex to help promote the game. Then it’s a case of testing the game thoroughly and squishing any bugs before we go live. Nearly there!